Needless to say, the experience was life-changing. After it, I felt compelled to pursue a career as a certified personal trainer and nutrition specialist. I wanted to empower, educate, and inspire other women to transform their bodies and regain a renewed sense of self -- just as I had. Along the way, Tim wrote and released The 4-Hour Body, and my story was featured on national television and throughout numerous editorials, spreads, and fitness publications -- the biggest of which was an appearance with Tim on the Dr. Oz show. Long story short: despite being a personal trainer and all my previous hard work to be a "weight-loss success story," I ended up being one of those Mego-Prego women who really went for it! By "went for it" I mean -- if my weight gain had been an accurate barometer of my son's birth weight, I should have given birth to a kindergartner! So my baby is born... and I find myself asking, "Now what, fatty?" Faced with the depressing reality that the new weight wasn't "baby weight" and was really all me, I made it my mission to swiftly re-apply the SCD principles to shed the post-partum pounds in record time. So many of us are miserable over the current condition of our bodies, we get motivated and inspired by reading stories such as mine, but that's not enough. We need something lasting. Something that will motivate us to walk away from the bread basket, or in my case -- back away from the sour cream twice-baked potato! Before I began, I committed to document the entire process via a weekly pictorial where I would stand raw, real, and exposed in front of a camera wearing nothing but the same tiny black bikini. When I felt discouraged, or was having a internal struggle over something I shouldn't eat, I would look at the photos of where indulging got me -- fat. Beginning the day after I gave birth, I followed every slow-carb principle that is outlined -- except for the cheat day. The reason? I was breast-feeding, and through trial and error, it turned out that keeping my diet consistent by eating the same thing (more or less) everyday was much better for my baby (and my sanity), than trying to sooth a horrific colicky newborn 12-24 hours after binge eating on a "cheat day." - Upping my daily fish oil to one gram per one percent body fat -- liquid form. Obviously, that'd otherwise be quite a few pills. Just with the slow-carb diet alone and zero exercise (due to some postpartum recovery issues between week one and week eight), I lost 36 POUNDS. And 12 months after giving birth, I hit my goal and lost 100 pounds (23 pounds of which were pre-pregnancy), and completely transformed my body. As a mom, life can be hectic, and it rarely goes according to plan. I always prepare ahead of time for those moments with some quick-grab protein snacks. Turkey wrap "roll-ups" with a little hummus and a sliver of bell pepper or cucumber inside is my fave! Or little snack-sized baggies of almonds sprinkled with cinnamon. Hard-boiled "hummus deviled eggs" is another. Prepare or fail, the choice is yours. Putting on a bikini seven days after you give birth is uncomfortable. Some might argue it's insane. Standing in front of the bright lights of a professional photographer week-after-week (often times without seeing much change), especially when you're a personal trainer who is 100 pounds over weight, is humiliating, humbling, and painful. 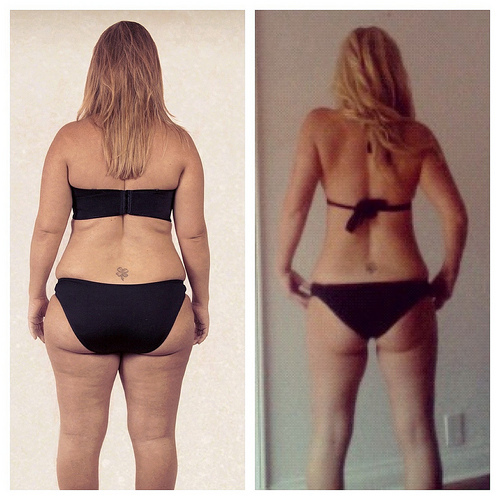 But transforming my body, documenting the journey, inspiring other mothers, and ultimately founding BikiniBodyMommy.com has been the most empowering 12-month process I've ever undergone. The journey isn't always easy, but nothing worthwhile ever is. My name is Briana. I am a 31-year-old mother of three, I've lost more than 100 pounds on the Slow-Carb Diet, and I work every day to be a success story. This post was originally published on Four Hour Work Week.